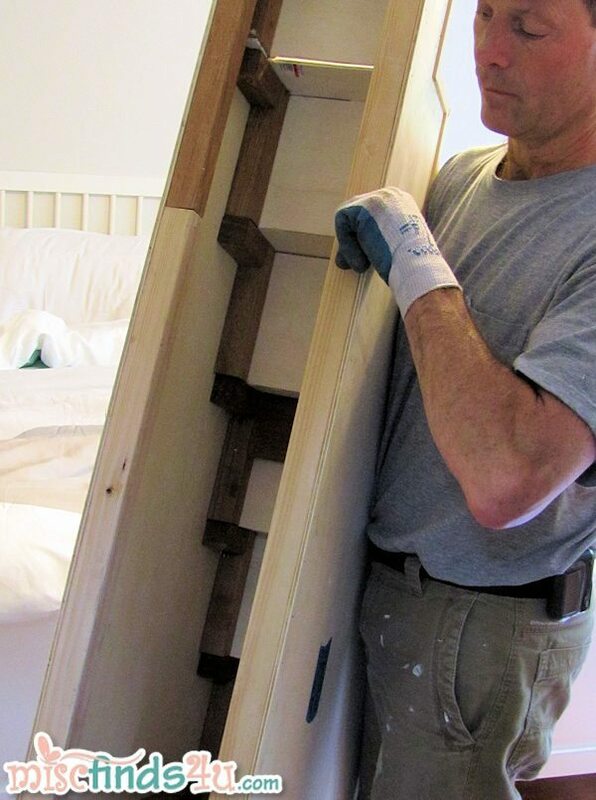 Check out the finished stairs here: DIY Pet Stairs – Paint, Carpet, and Completion! We’re still knee deep in our master bedroom remodel, and with the recent purchase of a king size bed, we found by fixing one problem (the need for more sleeping space for us and our dogs), we created another. 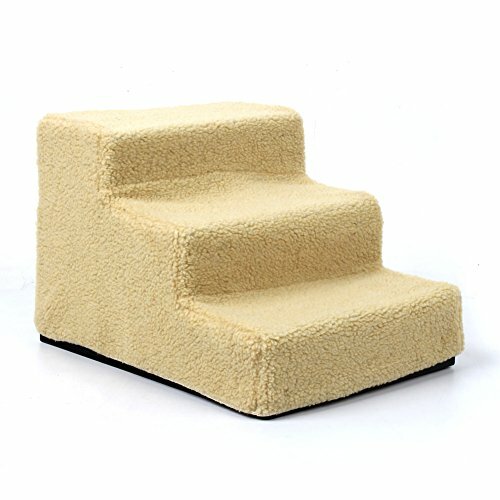 Specifically that our old dog stairs, a set of 3-steps by Pet gear, were now too short. Trying out the fit of the new (unfinished) pet stairs against the footboard of our new king size bed. Additionally, with our big dog in the final stages of bladder cancer, we are no longer able to let him up on our bed. Our 2K investment would be ruined in one visit from him. 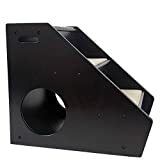 We decided to replace the one-size-fits-all dog stairs we had which were too small for the big dog and too big for the small dogs, with stairs specially sized for our two little dogs. 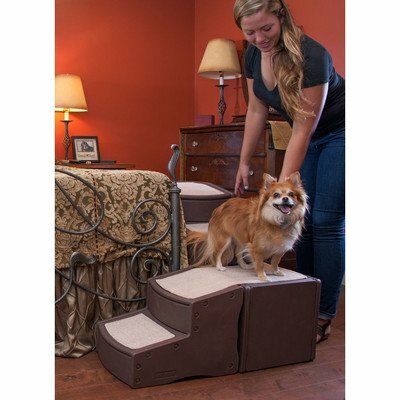 We initially considered the Petstairz 6 Step High-Density Foam Pet Step for Pets up to 50 Lbs but realized that our very neurotic Pomeranian would likely balk at stairs made from something with so much give. It would cost us $149, and we’d have no assurances she’d use it. But the real deal breaker was that the stairs took up too much room because of the way they’re designed and would have been a trip hazard for me. After checking out all the commercially pet steps available, the hubby decided to go all DIY and make them a custom set of stairs. I’m sure if you search you can find some free online plans, but be sure you take into account your own pup’s size and shape and change them as necessary. Also, note the height and width you have to work with within the location you’ll be using them in. 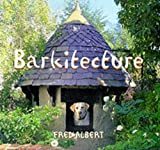 There are also books available for DIY pet projects including Black & Decker’s 24 Weekend Projects for Pets: Dog Houses, Cat Trees, Rabbit Hutches & More if you’re not ready just to throw something together. 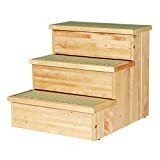 The hubby just pulled out some scrap lumber – 2×4’s and trim left over from the remodeling – and came up with what he thought was a set of stairs with deeper treads and a lower rise on the stairs for our 5 pound Maltese and 10 pound Pomeranian. His goal was to size the stairs to their body size, so he measured from the floor to their knees to estimate the height (rise) of the steps first. 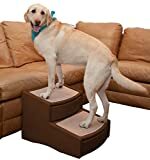 Then had them step up onto a cardboard box to estimate how much stair depth they needed to comfortably get their front and back legs both on the same stair. Then he divided the height of the bed by the rise and that gave him the number of stairs he needed. 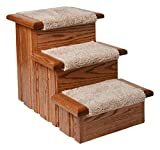 A look at the new do-it-yourself handyman-special wooden pet steps (unfinished). He cut the large side pieces (stringers) and then the treads along with a back piece to finish them off. He used screws and glue to put them all together. The steps are nailed together, and yesterday we tried them out. The girls adjusted well and if I’d been consulted on the design, which I was not, I would have made the top stair twice the length. I can see one of the girls sitting at the top blocking the other from getting up and/or down – that’s what our dogs do. Plus should they take a running start, which was necessary for them to get up our old stairs, there’s some slop at the top for them to stop within without falling off the end. A look inside the new DIY wooden doggy steps (unfinished). The stairs need the nail holes filled, and then we’ll be painting them. The hubby used decorative trim to finish them off. The trim isn’t necessary, but it makes them look better, and it’s also practical. 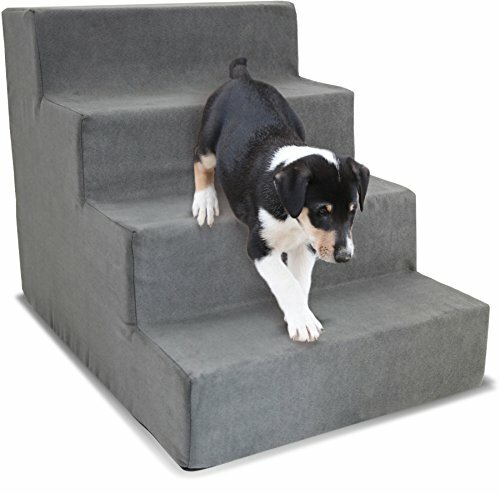 It gives the pup’s claws something to catch on, and it’ll help hold the carpet in place (we’ll likely use Velcro to attach them for easy removal for cleaning). 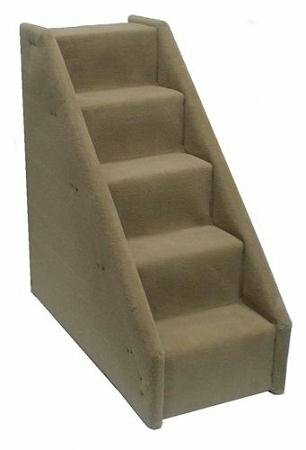 We’ll be covering the stairs with some leftover Flor carpet tiles from another project because they’re easy to cut, and they can be removed, washed, dried, and then replaced. 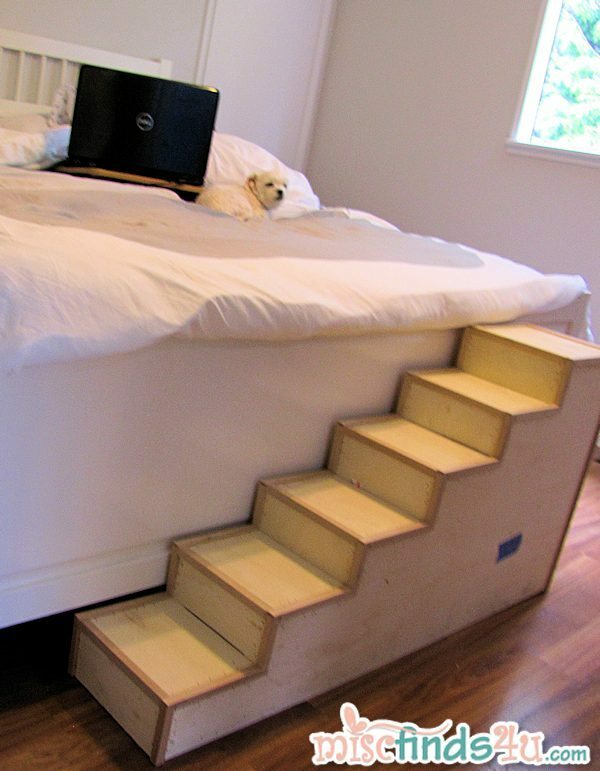 These homemade DIY dog stairs are phenomenally better than the plastic version we had before, and they fit perfectly because they were designed for the space. I only hope that once they’re in place, we can convince the big dog that it doesn’t mean he can get up on the bed. After 12 years of it being his spot, it’s hard to tell him he’s no longer welcome. 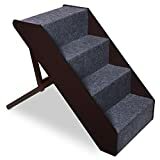 So how does the cost compare to purchased stairs? The closest comparison is a value line product that retails for $72 with the manufacturer noting that they have low-quality carpet on them, so the screws show. 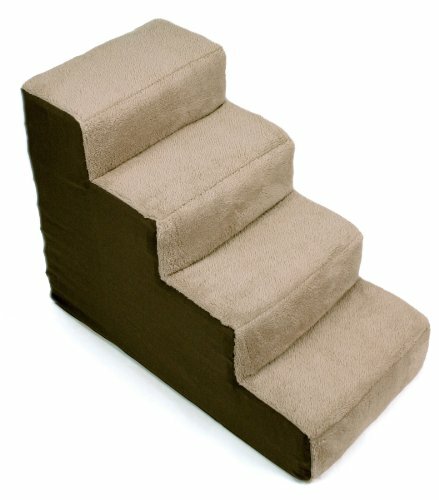 Stairs closer in size and quality to ours run $168. I think I’ll stick with the homemade version for now because we had the lumber on hand left over from other projects, so our cost was just our time. Not ready to go the DIY route? Or want something that takes up a little less space? 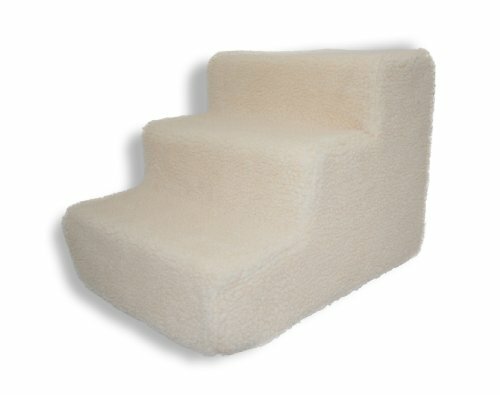 We use a high-density foam pet stair in the living room. The girls have no problem with them. Gracie is about 6 lbs. I wouldn’t use them for dogs over 15-20 pounds as I think they become unstable at that point. 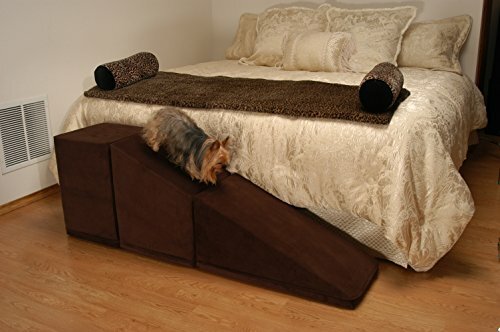 PuppyStairs 2-Piece Ramp with Cube -Chocolate Suede. 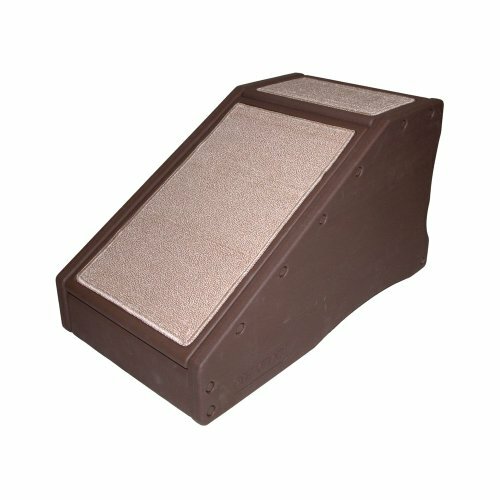 All covers are removable, machine washable; Foam is Industrial grade high-density foam, which firmly supports Pets up to 60 pounds. Sorry, a saw is definately necessary. I’d say a premade set of stairs is your best best. 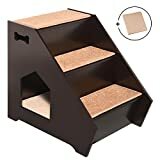 I want to make my own pet stairs but I don’t know anything about building anything! I have the exact same bed and a 10lb maltese. Would you share the dimensions please. Hi, I’m wondering what size this is? We recently got a king size bed and my baby is an oldie too. 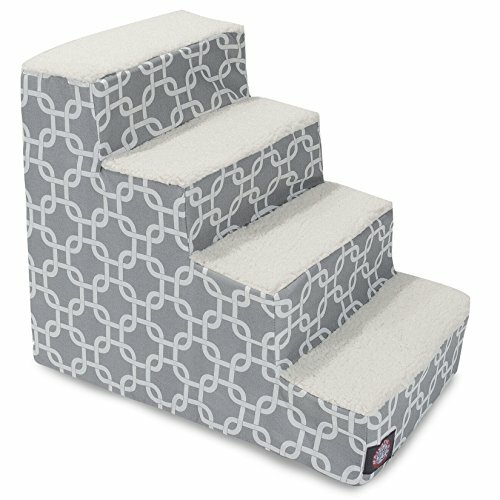 I’d like to know the height and width of each step, I’d like to have short steps as much as possible so my baby won’t have to jump so high each step, she already got a leg surgery and I don’t want her to strain her legs. Breaks my heart that she can’t jump on the bed anymore, can’t go back to bed in the mornings after she does her morning yard sprinkles 🙂 so she goes to my daughter’s bed instead. It’s HUGE and custom made to fit our bed. 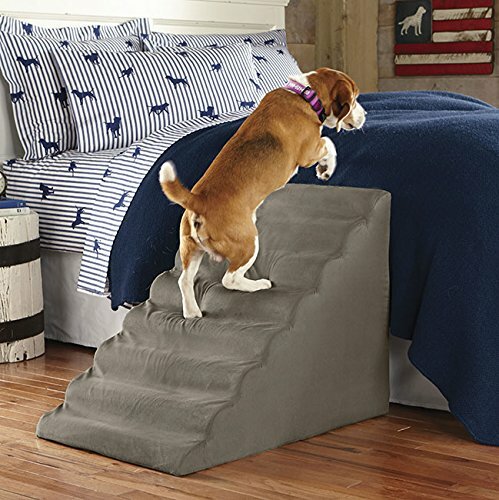 Your pet may need a ramp instead of stairs. We used them with our elderly dog and they worked well. Good luck. I Love, Love, Love the stairs especially the removable carpet tile idea. 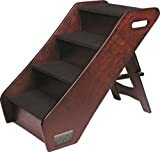 I have never been happy with the one I bought and you are so right about needing a longer top stair! Dog #1 always tries to sit at the top and block dog #2 and #3. Those are pretty cool, and that they are diy makes them even better. Easy Homemade Dog Food Recipes Even I Can Make!